Released to coincide with Stress Awareness Month, April 2012, HEALTHeME has compiled data from the American Psychological Association Stress in America Report, Gallup-Healthways Well-Being Index and Journal of Family Psychology, among other studies, with its own research, to produce new insights about stress management. Multiple studies conclude that Americans are increasingly stressed. Research results compiled in time for Stress Awareness Month reveal that Technology may be the missing piece of the puzzle to turn around the stress epidemic. More than 83% of Americans believe that stress strongly affects their health negatively, and nearly 40% report of eating unhealthy food to cope with stress, the data shows. The obesity trend is particularly alarming. Americans today weigh 20 pounds more in 2011 than they did 10 years ago. According to CDC (Centers for Disease Control and Prevention) more than one third of U.S. adults are now obese, with obesity-related conditions such as heart disease, stroke, type 2 diabetes and certain types of cancer as the leading causes of death. Women are especially vulnerable to the stress epidemic. Five out of the ten women experience a significant increase in stress, and married women are 50% more likely to be highly stressed than single women, the data shows. “As traditional methods to combat stress, such exercise and meditation, will continue to be important, Americans will need to increasingly rely on technology and smarter tools to be successful. One such tool is HEALTHeME, a service that combines predictive psychology and neuroscience to send personalized text messages that help combat stress and curb bad decisions,” says Sloan Rachmuth, co-founder of HEALTHeME. With more than half of its users reporting that they feel less stressed from receiving customized text messages, HEALTHeME allows you to track key health signals such as stress, sleep, mood and blood pressure. Weight Loss Makes You Happy! Looks like people who participate in a structured program not only lose weight but they also report being in a better mood http://www.reuters.com/article/2011/03/07/us-weight-loss-people-idUSTRE7264TV20110307. A recent review of many studies (31 total) found that people improved their mood when they tried to lose weight with diet, exercise, counseling, or all of the above. Researchers found that when people were involved in programs that focused on healthy behaviors (diet, exercise, water consumption), they lost weight and had improvements in their mood. However, there was no mood-boosting benefit for people who were just taking weight loss medications. "The amount of weight lost didn’t matter when it came to mood; even shedding a few pounds had a mood-boosting effect." For best results, combine daily exercise with a healthy diet. You won't just be healthier; you'll be happier too! Water makes up about two-thirds of your body weight. Seems strange, but it's true. Drinking water may also help you lose weight! A recent study on drinking water for weight loss found that people who drank two 8-ounce glasses of water before a meal ate 75 to 90 fewer calories. That is great news because drinking water can and cut 500 calories per day can lead to losing a pound a week! Not only will drinking water before your meal help you feel full before you start eating, but drinking water will also help you avoid sugary beverages like soda and juice. Most people drink around 300 calories or more per day, making sodas and juices a huge contributor to our daily caloric intake. Some experts estimate that people who drink two sodas per day gain one pound per week! There are other benefits of drinking water that may help you with your weight loss goals. People often report feeling tired, sluggish, and get headaches when they are dehydrated. So, staying hydrated may help give you that extra boost you need to exercise. Just remember: when you exercise, you sweat, and you need to replace those lost fluids with water! Drink water before and after every meal. Drink water before and during exercise. Fruits and vegetables like celery, tomatoes, oranges, and melons contain a lot of water and are packed with healthy vitamins and minerals! Drink sparkling water at holiday parties and social events. Carry a refillable water bottle with you – you will have a constant source of water and will be “green” too! Top 3 excuses that interfere with exercise and what to about them. Procrastination. We’re all guilty of putting something off even when we know it needs to be done now. In fact, procrastination is such an issue that this week has been named “National Procrastination Week”. And, let’s be honest, exercise is one of those things that you know you should do but, well, there are just so many “good” reasons to put it off. The reasons people use to justify why they aren’t able to exercise are perceived barriers that can easily be broken down. So, let’s get to the fun part: breaking down some common barriers so you can start living a healthier life NOW. You’re busy. I’m not arguing that fact. But, you’ll be busier if you have to head to the doctor on a regular basis because you have type II diabetes, heart disease, or another chronic illness, many of which can be linked to a sedentary lifestyle. Here’s the good news: just 15 minutes of exercise each day can lead to big improvements in your health. According to one study, exercising for 15 minutes per day can slash your risk of death by 14% and extend your life expectancy up to 3 years. We've got a challenge for you: go to your calendar right now and pencil in a 15-minute workout each day this coming week. Pretty soon, you won’t have any idea how you used to make it through an entire day without exercise. You know that old adage, something about objects in motion? There is truth in that saying and it can be hard to drag yourself out of bed (or off the couch) and get moving, but you'll actually have more energy after you exercise. In a study that came out last month, researchers found that 20 minutes of low-intensity exercise increased energy by 20% and decreased feelings of fatigue by 65% in study participants. If your day leaves you feeling sluggish by noon, take a 10-20 minute exercise break before you grab a cup of coffee or raid the break room candy jar. Plus, if you feel worn out at the end of a long day, just a few minutes of exercise will increase your energy and help you sleep better at night! I just saw a report that Jennifer Aniston’s fabulousness costs her around $141, 037.97 per year. Don’t have the kind of extra cash to get her toned arms and abs? Here’s a little secret: you don’t need to shell out major money for a personal trainer, a gym membership, and A-list celebrity style workout clothes in order to be fit & healthy. All you need is a pair of comfortable, supportive shoes for exercise, which will run you about $35. You can reach your fitness goals by walking, jogging, or doing some equipment-free workouts, like this 15-minute fat burning workout or a yoga routine for stronger legs. You don’t need to break the bank to be healthy, and a little investment in your health will save you big time money in the long run because you’ll save on medication costs, doctor visits, and potentially costly medical procedures. Now, doesn’t that sound like a wise investment? Remember, the things that appear to be blocking your road to good health are just temporary and they can easily be broken down. Once you plan a strategy to overcome your barriers, you will find your path to healthy living is wide open and excuse-free! 3 great exercises for your legs (no equipment necessary)! You don’t have to have fancy equipment to get strong, toned legs! In fact, some of the best exercises use just your bodyweight. And, although squats are an amazing way to strengthen all the major muscle groups in your legs, suggesting a “squat” is often a cue for a collective groan. So, enjoy these 3 squat-free moves that will do your (lower) body good! Wall Sits: Begin by standing with your back against a wall. Walk your feet out several feet from the wall. Keep your back, shoulders, and head resting comfortably against the wall. Slowly slide down the wall, until your thighs are parallel to the floor and your knees are directly over your ankles. Take care to keep your knees behind your toes to help protect them. Hold this position for 10-30 seconds, rest, and repeat 2 more times. For an extra challenge, place a ball or rolled up towel between your thighs, just above your knees. Squeeze the ball/towel to activate your inner thighs. Stationary Lunges: Step your right leg forward so that your right foot is several feet in front of your left (keep your feet hip-width apart). Your left heel will come off of the floor, leaving just the ball of your foot and toes on the ground. Stand tall with your abdominal muscles drawn in. Your hands can either rest on your hips or hang by your sides. Slowly bend both knees, lowering the left knee toward the floor, without allowing your left knee to touch the floor. Make sure your stance is wide enough so that as you bend your knees and lower toward the floor, your right knee is stacked directly over your right ankle. Slowly rise back up to starting position. Repeat for 10-15 repetitions on one side before switching legs. Incline Plank: Begin in a seated position, with your legs extended in front. Place your hands several inches behind your hips, with fingers pointing towards your body. Roll your shoulders back and down to open your chest. Press your hands and your heels into the floor to lift your hips toward the sky. Try to point your toes toward the floor. Allow your neck to remain in line with your spine by either looking straight up toward the ceiling or just a little forward (don’t let your head “hang” back). Hold this for 3-5 breathes, rest and repeat 1-2 more times. 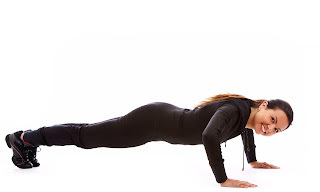 If you would like an added challenge, while in incline plank, engage your abdominal muscles and lift your right leg a few inches from the floor, without dropping your hips. Keep the right leg straight as you lift and continue to reach through your toes. Slowly return the right leg back to the floor and switch sides. If you are protecting your knees, bend your knees and place your feet flat on the floor prior to lifting your hips. All the information presented by HEALTHeME is for educational purposes only, intended to help you make informed decisions about fitness issues. This information is NOT a substitute for any advice given to you by your physician. Always consult your health care provider before beginning any nutrition or exercise program. Use of the programs, advice, and information from HEALTHeME is at the sole choice and risk of the reader. 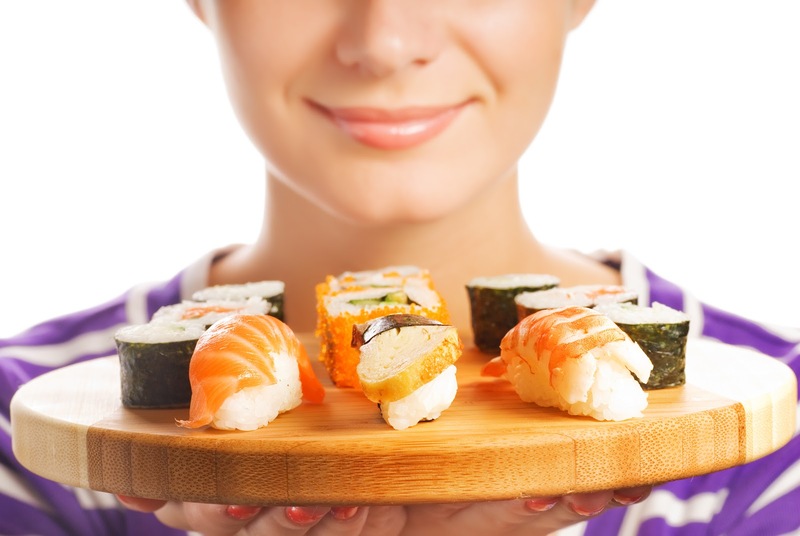 Surprising mood-boosting benefits of sushi. Sushi can make you smile! Let’s start with the obvious, fish. Fish is high in omega-3 fatty acids, which have been shown in a number of studies to have mood boosting benefits. According to one article, consuming a diet rich in omega-3’s has been shown to reduce the symptoms of depression. Biochemical researchers think this may have something to do with the way omega-3’s can impact your cells’ ability to absorb serotonin, a neurotransmitter that affects your mood. Fish like salmon and tuna, which are especially popular in the sushi world, are also great sources of omega-3’s. What else is in that wrap to make you so happy? Avocado slices are often added to sushi rolls and provide a big nutrition and mood boost! Avocados are high in heart healthy fats but one of the interesting things about avocados is that they are great sources of folate (or folic acid). In a review of research about folic acid and mood, researchers found that adequate folic acid intake may be an important player in the prevention of depression. It’s a wrap! When you order sushi and it comes rolled up in a nice little green package, think happy thoughts! Nori, which is a form of seaweed that is commonly used to wrap up sushi rolls, contains lots of vitamin C. A study of hospitalized patients found that receiving extra vitamin C improved their mood and outlook. If vitamin C can do this for those who are in the hospital, where it can be a challenge to have a cheery outlook, it makes me wonder what vitamin C can do for the rest of us? Top it off with sesame seeds. Ok, so maybe you’re going sans seaweed, in which case, sushi rice is often rolled in sesame seeds. Sesame seeds are loaded with manganese, which is an often overlooked mineral. According to one source, manganese is being recognized in it’s ability to help treat premenstrual syndrome (PMS) and may be able to improve the mood swings, depression, crying, tension, and anxiety that plague many women. Ready to break out those chopsticks? Well, here’s one more fact about sushi that will make you smile: it’s often fairly low in calories, which will help you slide right into your skinny jeans. Just remember to go low-sodium on the soy sauce and you won’t be singing the sushi blues! Forgiving can improve your health. Get over it and get happy! National “Get Over It” Day was March 9th. Yep, that’s right, 11 days ago. When I first realized I’d missed this awesome holiday, I considered throwing my hands in the air and shutting down my computer. But, in the end, I decided to put my lateness aside, just get over it and write about this topic anyway. We’ve all got our “stuff” – those little (or sometimes big) issues we just can’t put behind us. Whether it’s a relationship gone awry, a job we didn’t get, or those 10 pounds we just can’t seem to shed, we’ve all got something that we put into our emotional backpack then strap it to our backs, often letting the “baggage” wear us down. Here’s a funny little story of my own: When I was a kid in Elementary School, a boy in my class made fun of me because I had hairy arms. He called me “Grape Ape”, referencing a popular cartoon. It affected me so much that I actually started dreading warm weather, a time when I would have to wear short sleeve shirts and bare my hairy little arms. This continued for many years, sadly, even into adulthood. How silly? A little teasing and I was warm weather challenged for years. Now, I don’t think twice about my arms (and the abundance of hair that may or may not be there), but this little taunt stuck with me for many years. Do you have something like that in your past? Whether it’s silly or a more serious transgression, here’s the thing: holding on to worries, bitterness, anger, sadness or frustration from your past does nothing, and I mean nothing, but harm your current health status! According to one small study, having a negative view of one’s past decreases immune system functioning, increases reports of pain, and decreases daily physical activity and quality of life. In addition, dwelling on negative events of the past makes a person more likely to be depressed or anxious. Researchers in another study (link:) found that bitterness can negatively impact an individual’s metabolism and immune system, making it more likely that bitter folks will succumb to disease processes. So, what can you do? Well, forgiveness is a great place to start! One article discusses the importance of forgiving people, including forgiving yourself. In fact, one forgiveness researcher cited in the article claims that those who aren’t the forgiving type are two times more likely to suffer from cardiovascular disease. And, forgiveness appears to affect men and women differently: men appear to gain more from self-forgiveness, while forgiving others seems to benefit women a little more. As someone who regularly practices and teaches yoga, I often talk about the importance of letting go, accepting the past, and finding a way to forgive yourself and others. But, it’s often easier said than done and you’ve got to make a concerted effort to let things go. Maybe you find you can find a way to forgive through journaling, tearing up a piece of paper with past transgressions written on it, prayer, meditation, or literally sweating it out during a cycling class. Whatever you need to do, make this the day you forgive, the day you move past your past, and, well, “get over it”. 4 best pilates exercises for a strong core. Criss cross – Begin by lying on your back, legs lifted in the air with your knees bent to a 90 degree angle and placed directly over your hips in table top position. Interlace your fingers and place your hands behind your head, elbows out to the sides. As you exhale, slowly lift your shoulder blades off of the floor and keep them in this lifted position. Inhale at center and as you exhale, twist to the left, and bring your right shoulder towards your left knee. Inhale as you come back to center, exhale to switch sides. For an added challenge, as you bring your right shoulder towards your left knee, extend the right leg and reach it long, at a 45 degree angle from the floor. Take care not to pull on the neck and maintain a neutral position at your lower back. Repeat for a total of 10 – 12 repetitions. 2. Roll Up – Lie on your back and extend your legs long on the floor. Place a small folded towel under your lower back to help you maintain a neutral position. Reach your arms overhead without allowing your ribcage to lift and reach to the sky. In other words, engage your abdominal muscles and keep the ribs down on the ground. Inhale and draw the arms forward. Once your hands begin to reach towards your toes, exhale and gently release your chin towards your chest and begin to slowly roll up, curling your body into a C shape. It should feel as though you are peeling one vertebra at a time from the floor, as if you were lifting a pearl necklace off of a table, one pearl at a time. Pause any time you need to take another inhalation and resume the lifting movement with your exhalation. Once you come to a tall seated position, begin to roll down one vertebra at a time. Complete 5-10 repetitions. 3. Swimming – Lie on your stomach, with arms reaching forward (thumbs up toward the ceiling) and your legs extended out behind you. Draw your abdominal muscles in and attempt to lift your belly button away from the floor, as if an ice cube was placed directly under your navel. Now, lift your arms and legs off of the floor so that they’re hovering just an inch or two above the floor. Continue reaching your arms and legs in opposite directions and keep your abdominal muscles engaged. Begin to drop opposite arm and leg toward the floor and then switch sides. Allow your breath to be steady, as you continue to lower and lift opposite arm and leg toward the floor. Repeat these movements for 10 breath cycles. Pilates Push-Ups – Slowly make your way to a standing position. On an inhale, stand very tall. As you exhale, begin to roll down one vertebra at a time, bringing your arms close to the floor. Bend your knees as much as you need to allow your hands to come all the way to the floor. On an inhale, begin to walk your hands forward into a plank position (this is the same position you would be in to start a push up). Try to do this without allowing the hips to wobble side-to-side. On an exhalation, slowly bend at the elbows, lowering your body to the height of your elbows, hovering above the floor, and then push back up. Keep your elbows in by your sides at all times; this emphasizes the triceps muscles (back of your arms) and is different from the more traditional push-ups you may have done. Take care not to allow your hips to “sway” or “dip” towards the floor and keep your shoulders away from your ears. Feel free to bring your knees to the floor at any time to decrease the intensity of the move and allow you to maintain a neutral spine. After pushing back up into a plank, inhale as you pike your hips in the air. As you exhale, draw your abdominals in deeply and begin to walk your hands back towards your feet. Slowly roll up one vertebra at a time to bring your body back to starting position. Complete 3-5 repetitions. And, guys, Pilates isn't just for the ladies! These exercises are great for the inner athlete in all of us and many pro athletes include Pilates in their training. Click here to read more about the benefits of Pilates! Are your meds making you fat? Pills that can cause weight gain. Weight loss can be frustrating; especially if you feel like you’re doing everything right but still find yourself watching the scale tip in the wrong direction. Here’s a fact that adds fuel to the frustration fire: weight gain is a common, albeit undesirable, side effect of many medications. And, your prescription drugs may be one culprit behind your weight loss woes. Now, let me be crystal clear about something: it is imperative that you take your medications as directed, even if they’re contributing to your weight loss frustration. Medication compliance is a huge issue for patients (and their drug prescribing docs) because if you aren’t taking your meds as scheduled, it’s really tough to manage your illness. Shockingly, one report estimates that 342 people die every day as a result of not taking their medications as prescribed and nearly 40% of patients don’t take their medications as directed. Many people cite weight gain as a reason they don’t take their medications. So, I’m going to discuss 4 common drugs that may be contributing to your weight and give you a strategy to help you manage these side effects – while still complying with your medication schedule. 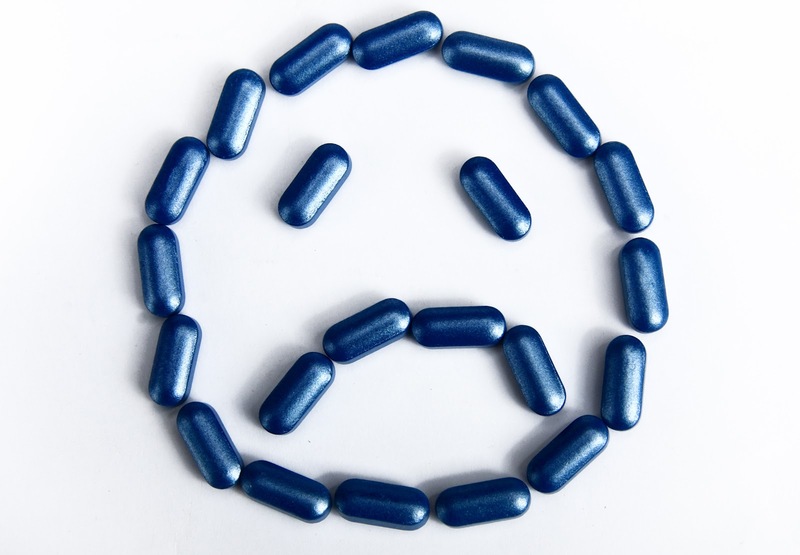 Antidepressants: Antidepressants are one of the most commonly prescribed medications in the U.S., with some reports estimating as many as one in 10 Americans are taking an antidepressant. And, about a quarter of the people taking common antidepressants gain weight, with many gaining 10 or more pounds. This is especially true of selective serotonin reuptake inhibitors (SSRIs) like Lexapro, Paxil, Prozac, and Zoloft. Blood Pressure: Medications that are used to help manage blood pressure, especially calcium channel blockers and beta blockers, can be linked to weight gain. When it comes to calcium channel blockers (e.g. amlodipine, verapamil, and diltiazam), the problem is that they often lead to water retention, which can tip the scales in an undesirable direction. Many people who take a beta blocker (e.g. metoprolol, atenolol, propranolol) experience a small weight gain. Plus, a common side effect of beta blockers is fatigue, which can make exercise a little more challenging. Migraine treatments: The World Health Organization reports that one adult in 20 experiences a daily headache, and many experience regular migraines. Migraines cause pain, sensitivity to light and sound, nausea, vomiting, and visual disturbances. Migraines are also a major cause of disability. So, it’s no wonder that many people receive treatment for this condition. However, several medications, like amitriptyline and Depakote, which are commonly used to treat or prevent migraines, are also associated with weight gain. Steroids: With Spring just about in full bloom, many asthma and allergy sufferers are finding their use of steroids in full swing as well. Steroids are powerful anti-inflammatory drugs and treat a variety of medical conditions, including arthritis, asthma, severe allergies, and other inflammatory conditions. Although steroids often provide much-needed relief, they also provide some excess fat deposits, especially in the abdomen and face. Steroids may also increase your appetite and decrease your body’s ability to absorb glucose, both of which can wreak havoc on your waistline. Exercise can help prevent migraines. According to a 2011 study, participants who exercised 40 minutes three times per week experienced the same reduction in migraines as those who took a commonly prescribed medication. One report cites exercise as an important adjunct to treating anxiety and depression. And, according to the data from several studies, the boost you get from exercise is similar to that provided by medication and therapy. The article also points out that several experts are trying to encourage primary care and mental health providers to write a prescription for exercise to aid in the treatment of depression. It’s commonly accepted that many who suffer from asthma can benefit from some forms of exercise. But, it may be less well accepted that the pain and stiffness associated with arthritis might be lessened with exercise. Researchers with a Duke University study found that exercise, even without weight loss, reduced the markers of inflammation that are commonly associated with arthritis. So, exercise benefits the joints even when it doesn’t result big-time changes on the scale. According to one report, just 15 minutes of exercise per day can reduce your blood pressure. In the study, participants who accumulated 90 minutes of brisk walking exercise each week saw a reduction in blood pressure. If you have a medical condition that warrants medication, your best bet is to take the drugs as directed and share your concerns about weight gain with your doctor. But, know that you can counter some of the less-than-desirable side effects with a dose of exercise. Who knows, a healthy balance of diet and exercise might just help you gain control over your medical condition, and, while working with your doctor, you may see a day when you don’t have to take as many medications. 5 reasons you aren't getting enough sleep (and what to do about it)! Daylight Savings has officially begun and that means 3 things: (1) there is more daylight so there is more time to go out and play, (2) warmer weather is right around the corner, and (3) we all might be walking around a little more sleep deprived. Most of us are already a little behind the eight-ball when it comes to sleep, with nearly 30% of Americans reporting that they get fewer than 6 hours of sleep each night. And, it appears that all this springing ahead really messes with our sleep patterns. A recent study reported that there is a 10% increased risk of suffering a heart attack in the days that follow setting your clock ahead. Experts aren’t exactly sure why this happens but they think it has to do with the interaction between sleep deprivation, immune function, and circadian rhythms. Although you can’t really do anything about daylight savings time, you can do something about the other reasons you aren’t getting enough sleep. Here are some common reasons you might be sleep deprived and what to do about it. Stress. Give me any illness or health concern and I’ll bet you we can trace it back to stress like the six degrees of Kevin Bacon. Sleep, or a lack thereof, is no different. Whether you can’t turn your brain off or you can’t relax physically (think racing heart or tense muscles), excess or chronic stress can keep you up at night. If you’re feeling especially tense, try to spend time unwinding before bed: take a warm bath, do some gentle stretching, journal to get your thoughts out of your head and on paper, do some deep breathing or meditation, or try progressive muscle relaxation. Progressive muscle relaxation is a technique in which you create tension in your muscles so that you can help your body relax more completely. This technique can help you get a better night’s rest. Your sleep environment. Creating a serene, Zen-like bedroom may sound like the stuff of fairy tales, but putting a little effort into creating a peaceful place can help you get more and better sleep. Everything from de-cluttering your room to dimming the lights before bed can improve your sleep. And, while laptops, smart phones, and DVR’s keep you connected and entertained, a high-tech environment can positively wreck your sleep. One study found that most people are using their high tech gadgets in the hour before bed. These gadgets emit light and this light can interfere with a normal sleep/wake cycle. Their recommendation? Keep your cell phone and laptop out of the bedroom and power down all technology a little while before you get ready for bed. And, it probably wouldn’t hurt to skip your late-night TV shows either. Late night eating and drinking. Eating and drinking just before bed isn't just a favorite on the list of things not to do when you want to lose weight; it's also on the list of things keeping you up at night. Eating close to bedtime can cause heartburn or indigestion – both of which lead to discomfort and won’t induce a state of peaceful sleep. Sipping on a cup of hot tea, water, or another non-alcoholic beverage before bed might help you reach your hydration goal for the day, but it will also make you more likely to have to get out of bed to visit the bathroom. To get ensure a peaceful night’s sleep, limit your late night drinks and try to avoid eating after dinner. Caffeine, alcohol, and smoking. Are you surprised to see caffeine on the list of things that derail your sleep efforts? Probably not. After all, caffeine is a stimulant and its effects linger in your body for many hours after you sip your afternoon latte. But, many people are surprised to see that an evening nightcap won’t help you sleep well. Some sources report that alcohol consumed as many as 6 hours before bedtime will disrupt your sleep cycles. And, smokers beware: researchers in one study found that smokers report feeling less rested after the same amount of sleep as their non-smoking counterparts. They concluded that smokers likely experience nicotine withdrawal during the night, which disrupts their sleep patterns. Your sleep schedule is all over the place. All parenting resources preach the importance of establishing a routine for your kids. Yet, as adults, we’re up early one morning, stay up super late another night, and try to make up for it on the weekends. It’s time to channel some inner toddler and get a bedtime routine going. Most experts agree that establishing a regular bedtime will help your body get into a rhythm. And, sticking with that schedule even on the weekends is key. If you take this one step further and establish an entire bedtime routine (think: warm bath, relaxing music, curling up with a good book) your body will start to recognize the cues that it’s time to power-down and you’ll spend less time counting sheep. If you want to sleep better, you’ve got to make it a priority. Many people don’t realize how important sleep really is and how dangerous are the side effects of deprivation. According to statistics from the Centers for Disease Control and Prevention, nearly 5% of people surveyed report nodding off while driving during the previous month. That's not only unhealthy, it's downright dangerous! So, take a good, long look at your evening routine and find at least one way you can get more sleep tonight. Sweet dreams! Best 4 stretches for your back! Side stretch for back pain. According to a recent study, the average American worker spends nearly 6 hours each day sitting at their desk. If you spend your day sitting at a desk or behind the wheel, you may feel as though your back is stiff and your shoulders are so tense and lifted so high that you have to peel them from the ceiling. Sound familiar? If this hits close to home, here are 4 stretches you simply must do to counteract the hours spent sitting. Try to hold each stretch for 5-10 breaths. Remember to keep breathing while you hold the stretch. Chest Expansion – Stand with your legs hip width apart, knees soft. Inhale as you reach your arms behind you, bringing your hands towards your lower back. You can place your palms on your lower back and bring your elbows towards one another, while keeping your elbows slightly bent. If that is not enough of a stretch, you can interlace your fingers (your palms will be facing one another) and begin to work to straighten your arms. You will be sending your hands towards the floor. Be sure to keep your elbows soft if you have clasped hands. Whether your hands are resting on your back or are clasped, allow your shoulders relax back and down. Sphinx Pose – Begin by lying on your stomach, legs extended and placed on the floor hip width apart. Place your forearms on the floor with your elbows directly under your shoulders, palms flat on the floor. Gently draw in your abdominal muscles and lengthen through the crown of your head. Press gently through your hands and forearms as you lengthen your spine, lifting your chest away from the floor as far as you feel comfortable. Although your chest and top of your abdomen will be lifted, keep your hips and legs grounded. Draw your shoulders down your back. Lying Twist – Roll over onto your back and bend your knees, placing your feet flat on the floor. Extend your arms out to the sides, as if creating the letter “T” on the floor, and place your palms down on the floor. Slowly lower both legs to one side, while keeping your shoulders relaxed and connected to the floor. Lower your legs as far as you are comfortable and as long as you can keep both shoulders on the floor. If your legs reach the ground, keep both knees bent and stack one knee on top of the other. Your gaze can remain up toward the ceiling or look toward the hand that is opposite of your legs. After holding the stretch for 5-10 breaths, switch sides. Restorative Savasana (pronounced sha-va-sana) – A few minutes in this yummy, relaxing pose and you will feel like you’ve taken a great nap! Take a blanket or towel and fold it up lengthwise so that it is several inches off of the floor. You may need to use several towels or blankets for added support. A bolster or pillow will also work. From a seated position and with extended legs, place the towel, blanket, bolster, or pillow lengthwise directly behind you. The edge of your blanket or bolster should rest by your hips but do not sit on it. Slowly lower onto the blanket or bolster. Your hips will remain on the ground but your torso and head will be supported by the blanket or bolster. You may want to place another folded blanket or towel or small pillow under your head for additional support. Allow your arms to rest by your sides. You will feel an opening through your chest and shoulders. You can keep the legs extended or bend your knees and place your feet on the floor if you are protecting your lower back. Close your eyes and enjoy! The best breakfast cereals for weight loss! According to some reports, many people eat 100% of their daily sugar allotment at breakfast! 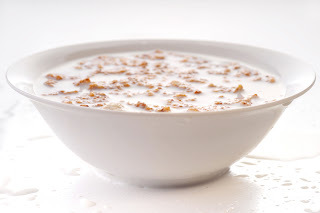 Trying to limit their sugar intake and reach their weight loss goals has many people steering clear of breakfast cereals. But, there are some cereals that can help you stay on track to shed those unwanted pounds and taste good at the same time. Here are 5 healthy breakfast cereals and a few notes on what makes them so great. Kashi Go Lean Crunch – This cereal may be a granola-lover’s new BFF. Granola is well-known for it’s high fat content, averaging almost 30g of fat per serving; 1 cup of this Kashi cereal has only 3g of fat. Factor in the 9g of protein and 8g of fiber per serving, and you’ve got a winner that’s full of great taste. Shredded Wheat – The only ingredient in this cereal is 100% whole grain, so you aren’t getting the extra sugar or fat that is common in many other breakfast cereals. This cereal is packed with fiber too, which is a major player in weight loss. Top it off with fresh fruit, like raspberries, to add a little extra flavor. Fiber One Caramel Delight – If you’ve got a sweet tooth and you’re trying to stay on track to reach your weight loss goals, this one’s for you! Although this cereal does contain a bit of sugar, it still falls much below most sugar-laden cereals. And, 1 cup of Caramel Delight provides 35% of your recommended daily fiber goal. Multi Grain Cheerios – It’s a classic cereal with a multi-grain spin. The great thing about this cereal is that it has earned the American Heart Association’s Heart-Check mark, meaning that this food meets the guidelines to be considered a heart-healthy food. Cheerios are a low calorie, low fat food and the Multi Grain version also comes in a Peanut Butter flavor! Oatmeal – Although it takes a few minutes of prep, no healthy breakfast list would be complete without it. Oatmeal has been found to help reduce cholesterol, lower the risk of colon cancer, and help regulate blood sugar. One word of caution on oatmeal: the instant flavored packs of oatmeal can be loaded with sugar. So, try plain oatmeal and mix in some cinnamon and fruit for extra health benefit (and great flavor, too). Happy National Cereal Day, everyone! Now, go out and celebrate with a bowl of breakfast goodness!